December Volunteers of the Month are the Race Packet Pickup Volunteers! 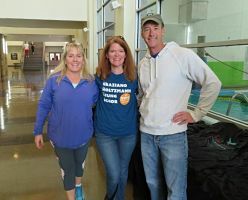 Many thanks to the volunteers who helped pass out race packets at the Back Country Half-Marathon for Highlands Ranch Community Association-Therapeutic Recreation. Two shifts of parents and supporters handed out race packets and shirts to all runners. Thank you for supporting the TR program! The Grinch Storybook holiday program is a huge success! 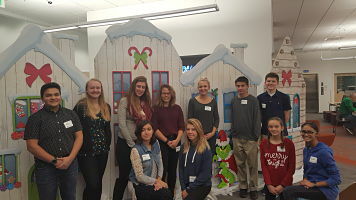 A group of teen volunteers make it a special event for everyone. The Grinch did not steal Christmas from the Lone Tree Library! Thanks to all the volunteers that make a positive difference in their communities. Storytime comes alive when Christopher is in the room! Christopher brings his best each and every week when he volunteers at the Highlands Ranch library. He shows unlimited kindness toward all participants. He is a mentor to each new family that attends, singing the songs, doing the movements, and enjoying the stories with everyone. Christopher’s enthusiasm helps make Storytimes special and successful. Sensory Storytime was created to better serve patrons on the autism spectrum or who are otherwise differently abled. Christopher helps make this Storytime possible. His enthusiasm for volunteering is contagious and delightful to witness for both patrons and staff. 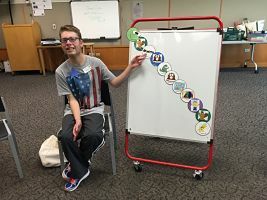 Christopher became interested and involved in helping with Sensory Storytime as it was being created in 2011, and he was thrilled when he was asked to become an “official” library volunteer in January 2016. Christopher is also active in his community in other ways. He is involved with therapeutic recreation programs at Southridge Recreation Center and is currently on the Unified Basketball team. He is a participant and volunteer with the F.A.C.E.S. Disability Ministry at his church, and also ushers every Sunday. His hobbies include gardening, walking his dog Bingo, and doing arts and crafts. Castle of Terror Comes to Life!